I am learning new things every day. Some things I don't understand. This is one of them. Have you ever met someone for the first time, and felt like you've known them for years? Maybe you have. As a pagan, I believe in reincarnation. I feel like I've known some of my friends for longer than I've known them physically. But in this case, I never actually got to meet him. I saw his picture on the web, and thought to myself, "I know him. Somehow, I know him." I never got a chance to find out. 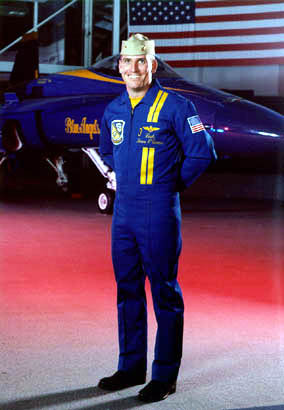 Blue Angel Lt. Cmdr. Kieron O'Connor was killed on 28 Oct 1999 at approximately 12:20 PM EST. This page is dedicated to his memory, for the inspiration he gave me. Fly free, Angel. Fly free. GA. 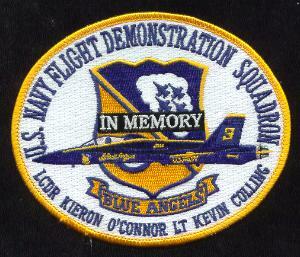 Killed in the crash were LCDR Kieron O'Connor and Lt. Kevin Colling. training flight in preparation for the upcoming "Community Appreciation"
conducted at this time to determine the cause of the crash. the O'Connor and Colling families." Send an e-mail to the WebWitch.